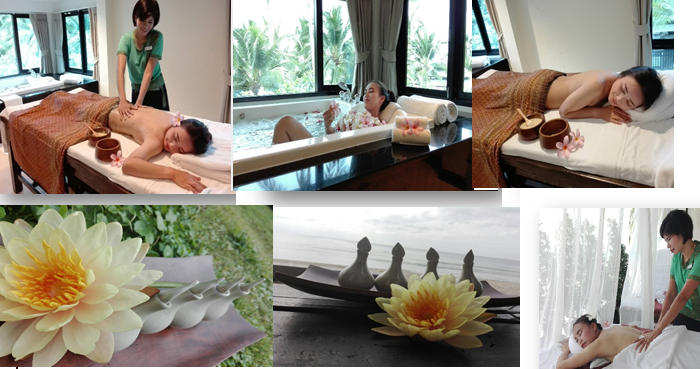 While Thai massages have taken the world by storm, authentic aromatherapy massage in Thailand by a Thai therapist can certainly elevate a spa outing to another level. My destination Koh Chang in the Eastern part of Thailand was not easy to reach. With two flights, a road journey and a ferry ride, my energy was admittedly low and a recurrent shoulder ache did not help either. When I finally reached my destination, the KC Grande Resort & Spa located on the beach front however things changed. Perhaps it was the sound of the sea and the calm environs of the resort that uplifted my spirits. And to my delight, I had a little surprise in store when I was offered a spa massage that felt like God-send. I was thrilled to start my Thailand sojourn on this relaxing note and soon enough was at the Chiva Spa that overlooked the sea. In fact there are massage tables outside too. I however choose a spa room inside and I was first asked to smell four essential oils – Lavendar, Ylang, Lemongrass and Rose and choose one which would be the oil used for my aromatherapy massage. I choose Ylang because it had a lovely fresh floral fragrance that struck a chord instantly. My masseur Panchalee P, led me to my spacious spa room done up in cream and beige tones and asked me to change before lying face down on the spa table. Using the aromatic Ylang oil, she started with a back massage that went on for close to an hour where it was her hand techniques that worked like magic. Using a combination of palm presses, thumb pressure, syncronised hand and finger movements that included circles, cupping and kneading she ensured that every tired muscle in my body was rejuvenated. Using firm strokes like elbow press, loose fist knocks, forearm rolls and finger and thumb walking, she ensured that I went into a state of deep relaxation. Repeating the same over my legs, hands, neck and shoulders and also giving me a relaxing face and head massage in the end ensured I was completed rejuvenated. A warm ginger, lemon and honey drink at the end of the treatment was the perfect way to end this wonderful treatment. And yes, the shoulder pain had vanished too!